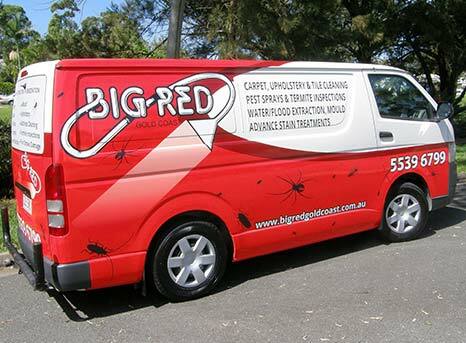 From Carpet Cleaning to Pest Control, Big Red offers a range of services that will keep your home or office pest-free and squeaky clean! Our technicians are fully qualified clean machines, and with ‘eco-friendly’ options available, we guarantee you’ll love our clean! Another business is currently using our name “Big Red Carpet Cleaning” and “Big Red Gold Coast” in Google Adwords to promote their business – as seen on A Current Affair – 29.09.17. We’ll give your carpets a deep and superior clean, leaving your floor looking great and smelling fresh! Say goodbye to nasty pests! Let us get rid of unwanted visitors with our environmentally-friendly “GREEN” Spray. Old furniture is charming, dirty furniture isn’t. We’ll make yours look brand new! Porcelain, Terracotta, Slate or Granite – whatever the tile, we can clean it. We’ll remove dust mites and bacteria so you can sleep easy! Protect your furniture so it lasts longer! Our Big Red technicians are qualified, certified and fully insured. We’ve undergone specific training and use only the best equipment and chemicals. service, integrity, pride and technology.